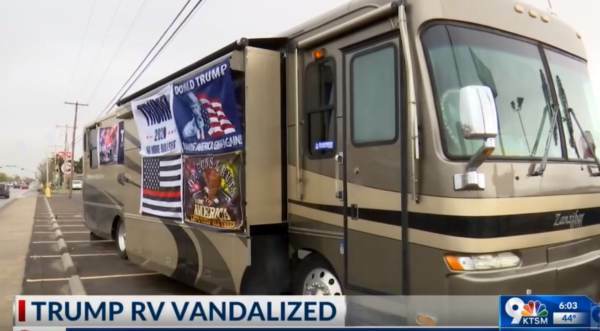 A supporter of President Donald Trump who was selling merchandise in Texas had their recreational vehicle severely vandalized early Saturday morning. When President Donald Trump spoke in El Paso last month, many vendors traveled to the area including Tina Marie Patterson-Mann and her family. The family had sold their home and bought a RV — which served as both a place to sell their ‘Make America Great Again’ gear and their home. “We heard this bam and I said ‘what the heck was that,” Patterson-Mann told KTSM. A vandal had smashed their windows, mirrors and headlights. “I understand the fact that my family and I are the minute (small) minority here in El Paso. This is a motivated, political, racial crime,” Tina’s husband, Max Mann told the station. The family has filed a police report and says that the attack on their home and business will not deter them from selling merchandise that is supportive of the president. Last month, a Massachusetts woman was charged with assault and battery after hitting a ‘Make America Great Again’ hat off of a stranger’s head at a Mexican restaurant. This attack is the latest in many cases of people who support the president being targeted for their political views. Later in the month a Turning Point USA activist was attacked by a deranged leftist at UC Berkeley. Earlier that week, conservative activist Scott Presler reported that he was hit with projectiles and had gay slurs shouted at him while out holding a pro-Trump sign and advocating for the president’s policies. The same morning, a woman locked her Twitter account after posting a video of herself harassing an elderly man in a thrift store over his Make America Great Again hat. A couple also had a gun pulled on them while shopping at Sam’s Club because they were wearing MAGA hats. None of these incidents have received mainstream media coverage.